your recording. Use the real-time SPEAKER-RECORD fader for fine volume adjustment of both the AUDIO SPLENDOR output and the record level. Recorder-Player and WMP can play MP3, WMA, and WAV files via the MOTU 828MK3. The Burwen Recorder-Player will play W64 files. full onto the Burwen Recorder-Player. In the dialog box that appears, select the type of file, bit rate, and number of channels, and select a destination. SOUND.bin for future use to the same destination and change its name (keep .bin) to associate it with the music file. slider. ALT + the underlined letter operates the control from the keyboard provided the Burwen Recorder-Player window has focus (recently clicked on). After pressing ALT + V hold down the left or right arrow keys for smooth PLAY fades. ALT + D and the arrow keys produce smooth record fades. to remove “BACKUP” after pasting. AUDIO SPLENDOR.xls should be saved with settings you want the next time you open the workbook, Click SAVE WORKBOOK at TONE CTRL, Pg Dn. Copy C:\BURWEN AUDIO\ AUDIO SPLENDOR.XLS and paste in C:\BURWEN AUDIO\BACKUPS. This file can also be restored from the installation disc. Output is checked, click PROCESS AUDIO to connect with WMP. letters and numbers and then saving the same subtitle in the TONE LIB allows WMP to automatically recall the library settings when you select the track. Excel calculation is held off until you release the left mouse button after moving a control, when you see an hourglass. calculation at Automatic at Tools, Options, Calculation. The first time you operate a control, calculation will switch to manual. Do not be confused by the different modes of operation. The BURWEN AUDIO processing part of AUDIO SPLENDOR is actually 3 independent programs. output from 2-channel stereo sound files. 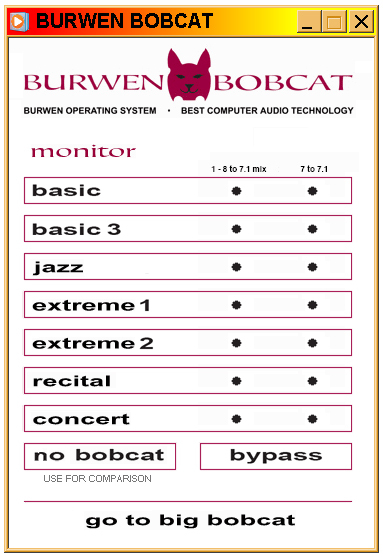 BURWEN AUDIO icon at the right of your Taskbar. BURWEN BOBCAT FILTER. It will open a BURWEN BOBCAT window like below. Keep the other programs closed. to the correct address by checking the appropriate boxes at the bottom of the MIXER window. starting points. In the Big Bobcat window try all 21 selections and compare to No Bobcat. Clicking on the bobcat face at the top opens these instruction pages. Smooth selections have very little low frequency compensation, enabling the same level as Bypass. 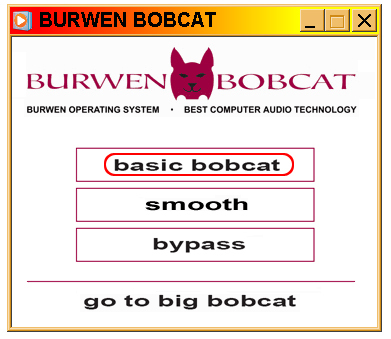 In the Windows Media Player only, files previously processed by Burwen Bobcat automatically play in Bypass mode instead of your selection. selections the entire CD will have the Burwen Bobcat sound. For highest fidelity start with unprocessed .wma lossless files. make MP3 files use the Burwen Audio Converter below. you to select a destination folder. All the files will be automatically converted using the circled Burwen Bobcat process selection. 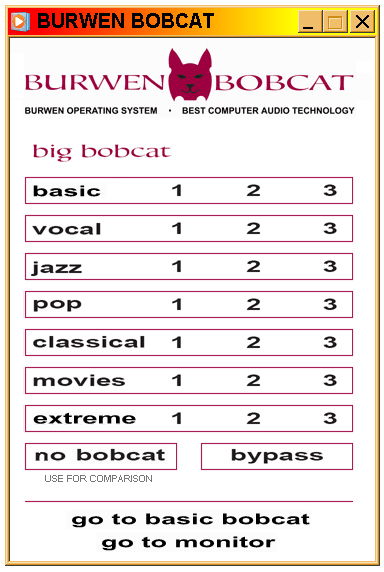 processing type, Basic, vocal, jazz, pop classical, or movies and the number indicates selection 1, 2, or 3.
installed the icons will become visible if you install the utility, bobcatshell_inst.msi. library to processed MP3s for your iPod.